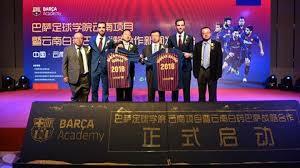 November 7 – Barcelona have entered into a three-year regional sponsorship deal with Chinese pharmaceutical brand Yunnan Baiyao with a focus being the opening of three Barça Academys. The academies will be in the province of Yunnan, situated in south-west China, in the cities of Lijiang, Kunming and Fuxian Lake. The Kunming and Lijiang centres are ready to open immediately and construction work is underway on a training centre in Yuxi Chengjiang, Fuxian Lake. Yunnan Baiyao becomes a partner across the Asian-Pacific region for Barcelona, specifically in China, Hong Kong, Macao and Taiwan. Barcelona will now have six academies in China and 18 throughout the Asian region. In total there are 49 Barça Academy projects around the world, more than 180 Camps and 50 Clinics. The club says it is present in 53 countries on five continents, involving more than 45,000 children. The Yunnan Province academies will be managed by Yunnan Investment Sports and Yuxi Fuxian Lake Protection Development and Investment Co., Ltd and will hold basketball as well as football camps. Yunnan Baiyao has a market value of more that 100 billion yuan and its Hu Run and BRANDZ brands lead the Chinese pharmaceutical industry. The company has been gradually expanding into Europe, the US and Japan.